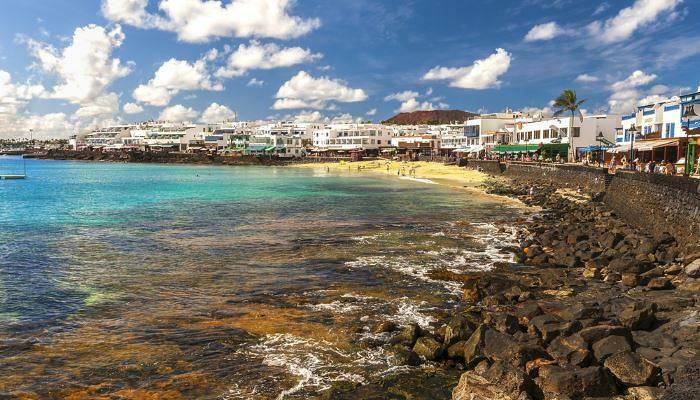 One of the most scenic Canary Islands, Lanzarote is filled with a whole host of fabulous beaches that us Brits just love. 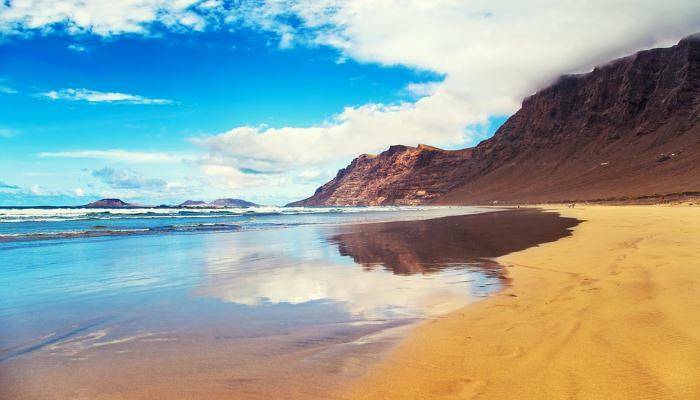 Thanks to its volcanic roots, Lanzarote boasts everything from black sand beaches to golden sandy coves. Here are some of our favourites! 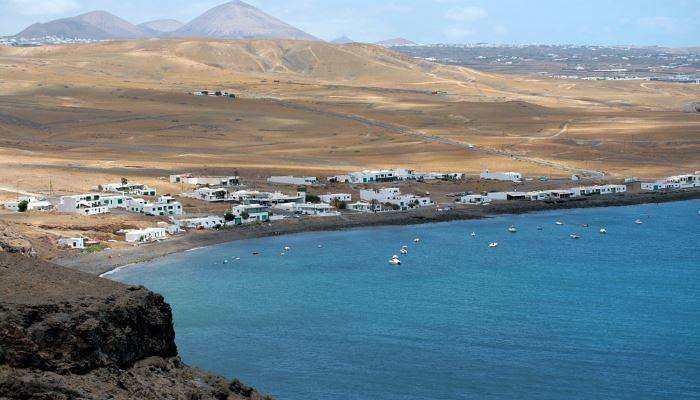 Literally translating to ‘Burnt Beach’ in Spanish, this sleepy black sand beach borders a pretty settlement of sun-bleached houses and sits just down the coast from the popular harbour of Puerto Calero. 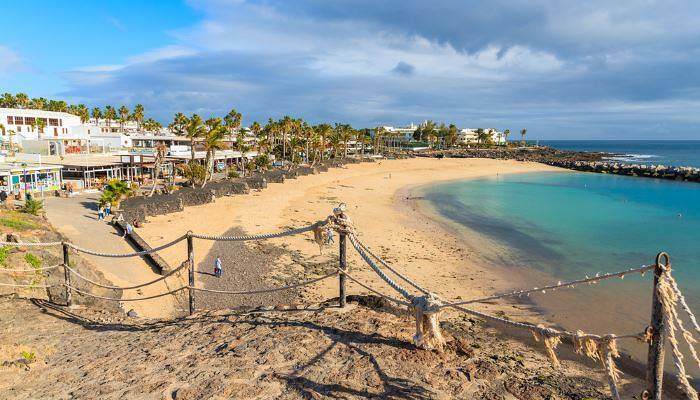 The volcanic beach is a favourite among locals and it is a true hidden gem, with its crystal clear, and calm, waters providing an excellent place to take a dip. Be sure to bring a towel, sunshade and picnic though, as there are no sunbeds here and a very limited number of traditional restaurants. On the edge of Playa Blanca sits the pretty cove of Playa Flamingo, guarded by the sea wall, this little beach is a favourite among families. The wall creates still waters and the soft sand means there is little danger of stubbing tiny toes. The beach also has showers to wash off sandy hands and feet before eating at one of the convenient cafes a little way along the promenade. 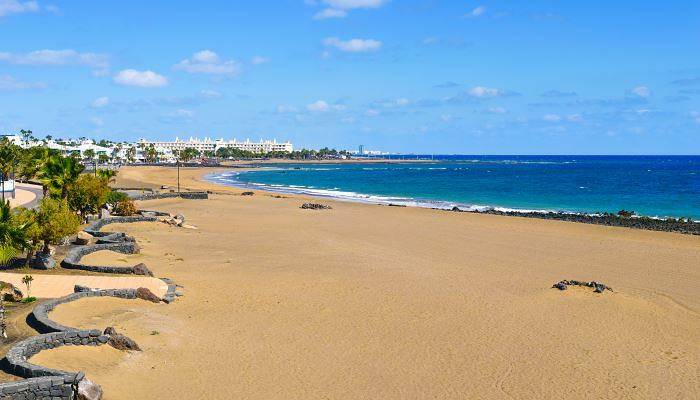 A short way down the coast from the popular resort of Puerto del Carmen, lie the golden sands of Playa de Matagorda. 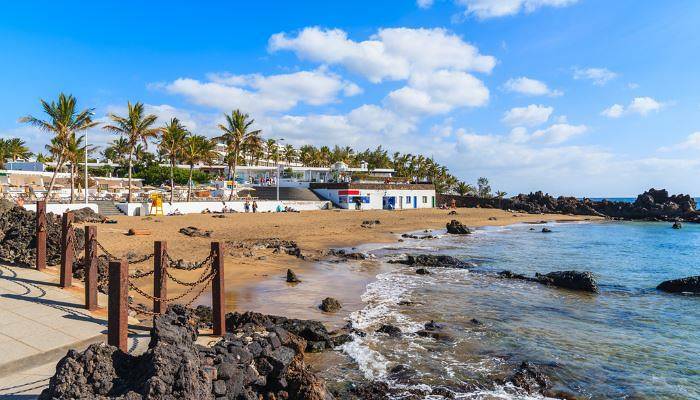 This pretty resort was built to accommodate the overspill of tourists from Puerto del Carmen in the 90’s and is now a tranquil alternative to the hustle and bustle of the frequented tourism hotspot. Unspoiled, thanks to the avoidance of high rise buildings and ugly infrastructure, this pretty beach resort provides an excellent destination for your next family holiday. And with a copious amount of space, quiet waters and soft sand, you will get everything you are looking for from Matagorda. With sun-bleached buildings, soft white sand and calm glistening waters, Playa Blanca is the epitome of Spanish living. If you are looking for a friendly, but quiet beach, popular with tourists and locals alike, this is the spot for you. Playa Blanca is so well loved in fact, that an entire town has formed around it and adopted its name. The marina, chic hotels and authentic restaurants set the resort apart from the rest and make the beach one of the best on the island. With blanco translating to white from Spanish, it’s no wonder how the brilliant sands of Caleston Blanco got their name. As well as being rather picturesque, it also provides a lovely spot to take a dip with its calm waters. Secluded in a quiet cove, there is very little around these pure shores, so you may need a car to get here. The drops of hardened volcanic lava offer an incredible juxtaposition of the earths most fascinating elements, making it a great spot to take some beautiful snaps. 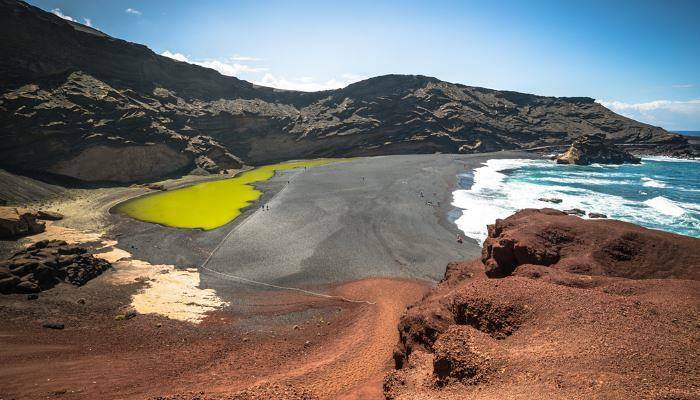 This unusual looking black sand cove could be one of Lanzarote’s best kept secrets. With bright blue sea set against the sandy black shore, the beach is certainly striking in its appearance. This is then heightened by the acid green lagoon sitting at the foot of the volcanic cliffs. Named after its fluorescent green colour, Charco Verde gets its intriguing shade from the volcanic minerals and micro-organisms in the water, believed to be unique to the lake. Although visitors are unable to swim in either of the bodies of water, it’s still well worth the visit for the sights alone. 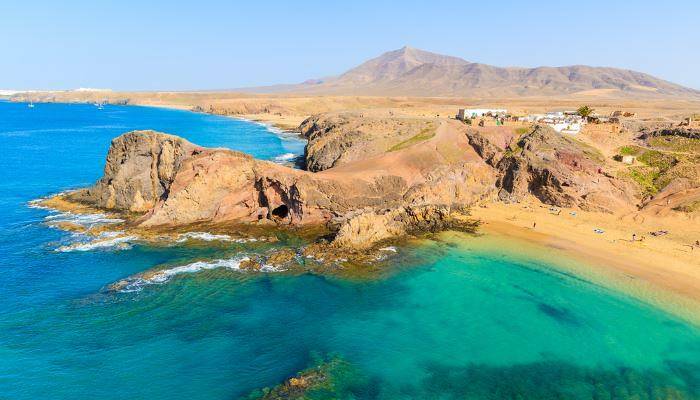 Playa del Risco, is possibly the most secluded beach on the island and is only reachable by foot with a trek down from the tiny settlement of Yé. This can take around an hour, however it means that when you finally reach this beach, it’ll pretty much be all yours! 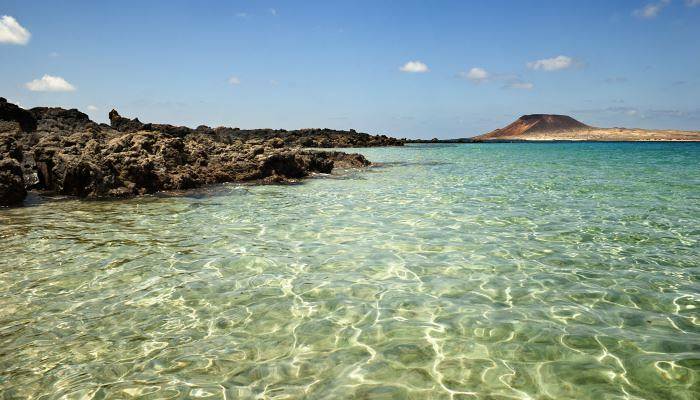 Situated on the north of the island it is about as close you will get to La Graciosa, the unofficial eighth canary island, without visiting it. While this beach may take a lot of effort to reach, it is certainly worth the trek, which can be equally as enjoyable thanks to the marvellous unspoiled views. This beach may look ordinary to some, but beneath the surface lies something pretty special. 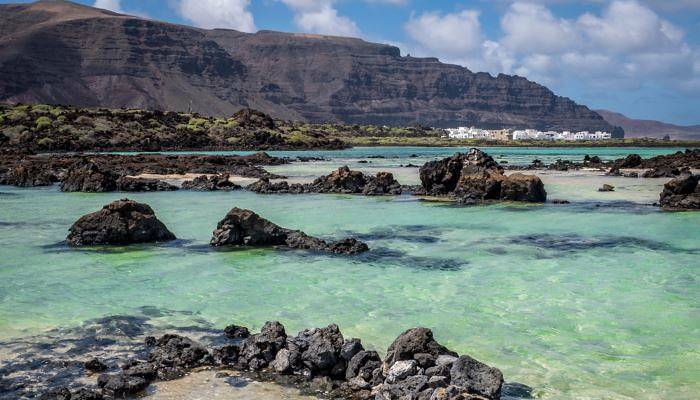 Under the water of Playa Chica lies not only one of the best snorkelling spots on the island, but also one of the best in Europe! The calm warm water provides brilliant conditions for a sea-safari, where you can watch the water come to life before your eyes. Don your snorkel and mask and swim amongst the hundreds of different species of sea-creatures. After this treat for the senses, you can lie on the soft white sand and take in the warm Canarian sun. World renowned among surfers, Famara is one of the best places in Europe to ride the waves. Its geographical position on the north shore of Lanzarote means it bears the brunt of the wind, which create brilliant surfing conditions. The golden sands stretch out for over three miles, meaning there is more than enough space for sunbathing, but you may not want to take a dip in the sea. The currents are extremely strong and make for dangerous swimming conditions. Widely regarded as some of the island’s best beaches, the Punta de Papagayo are a cluster of untouched coves stretching around the most southerly peninsula of the island. The warm emerald waters and golden sands lie largely untouched thanks to the area’s protected status. However, this does mean you may encounter one obstacle – how to get there! The only routes to the beach are by boat or dirt track, so you may want to think about arranging some car hire. Which is your favourite? Why not take a trip out to the island to help make your mind up! Try our comparison tools to find the best deals for you! flights, holidays, hotels and car hire. At dealchecker, Polly is writing up the fabulous deals that get sent out to our subscribers and checking that you are getting the best bang for your buck. When she's not writing about travel, she's out doing it - whether its somewhere different in the UK, or jetting off somewhere a little further!